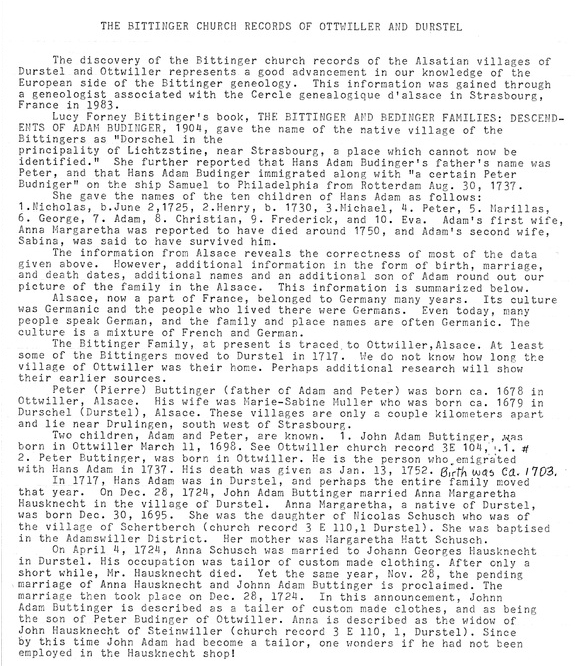 Where did the Bedinger family originate? Family tradition, the family seal with the Büdingen arms, early accounts of the family told by Hans Adam to his grandchildren, and onomastic reasoning lead us to believe that the Bedinger family and its name originated in Büdingen. But, to trace the family genealogy in Europe, we need to know where Hans Adam Büdinger was living before he came to America. Where did Hans Adam Büdinger live before he brought his family to Pennsylvania? 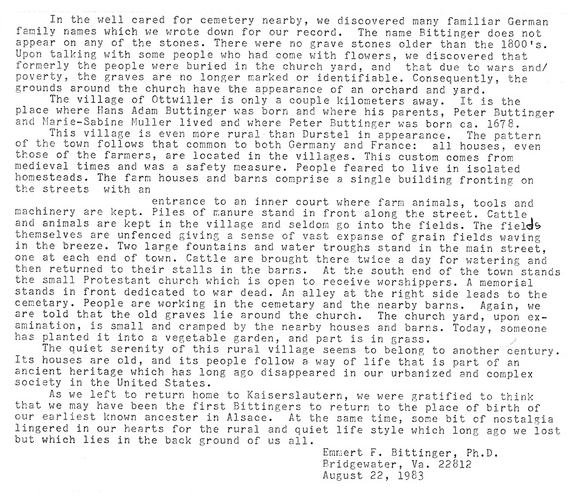 In the narrative below, Dr. Emmert F. Bittinger relates his and his father's search for the European roots of their ancestors. Lucy Forney Bittinger in her landmark work on the genealogy of the Bittingers and Bedingers [i] was stumped by the question. She wrote that Adam was a native of "Dorschel in the principality of Lichtzstine", which we know is a non-existent place, and she questioned if rather it were "(Lützelstein? ), near Strasbourg--a spot that cannot now be identified." Following a false lead, many Bedingers interpreted "Lichtzstine" to be "Liechtenstein" and believed that this picturesque little principality surrounded by Switzerland and Austria was the home of Hans Adam. 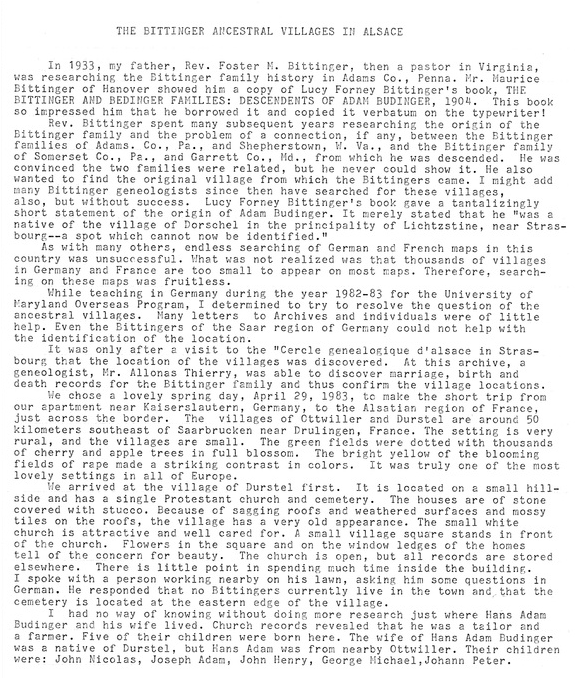 The discovery by Dr. Bittinger that the villages of Durstel and Ottwiller in Alsace, France were where the Büdingers lived before their immigration to America is told in the narrative that follows. 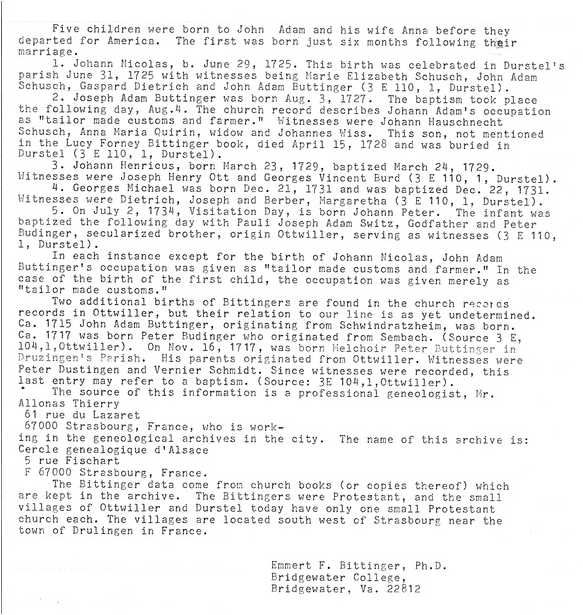 The vital records uncovered by Dr. Bittinger of Hans Adam Büdinger and his family in the Protestant churches of these two villages provide not only proof of the locality of Hans Adam's birth but also a starting point for further discovery of the Bedinger ancestry in Europe. 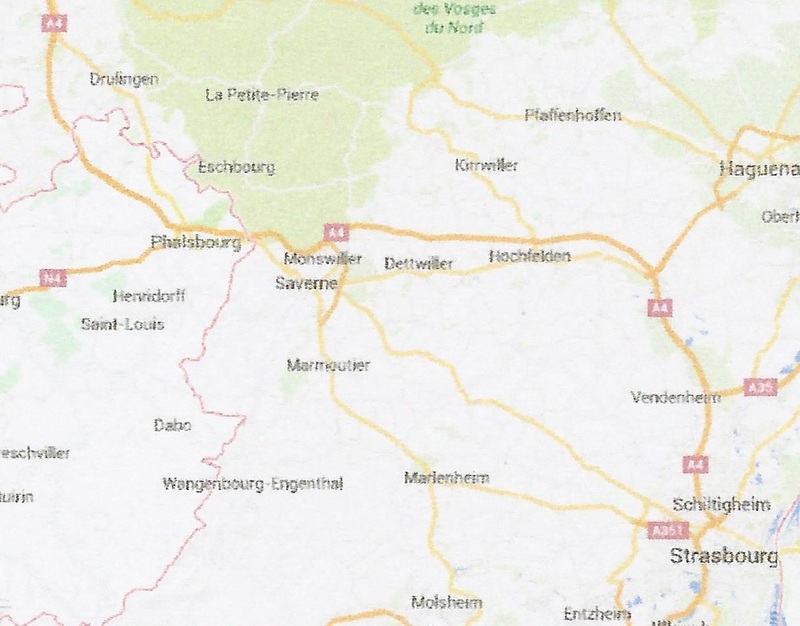 La Petite-Pierre (Lützelstein) is about 25 miles northwest of Strasbourg (lower right corner) in the Bas-Rhin department of Alsace, France. Ottwiller and Durstel (not lebeled) are about 7 and 10 miles west and northwest, respectively, of La Petite-Pierre. Lützelstein Castle a relic of the now defunct territory of Lützelstein was erected in the fifteenth century. The castle is in the village of the French name "La Petite Pierre" a few miles east of Ottwiller and Durstle. 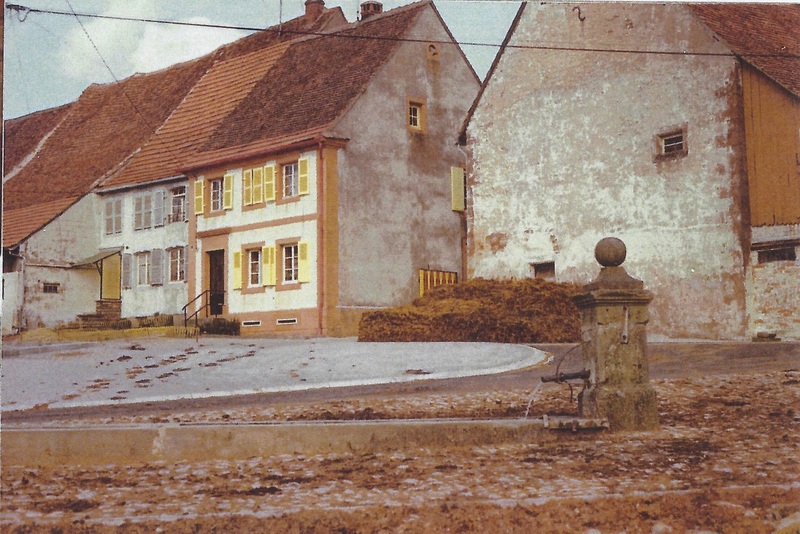 The photos of Protestant churches and street scenes, below, in Durstel and Ottwiller were taken by Dr. Emmert F. Bittinger during his visit in 1983. 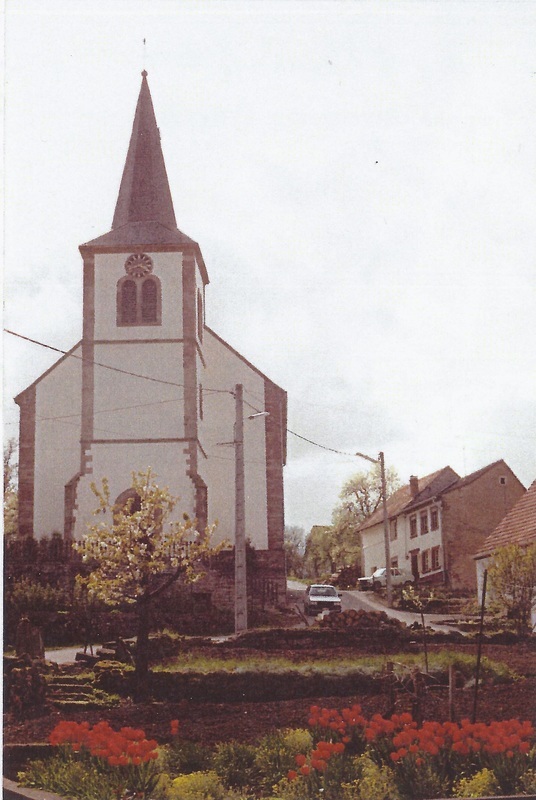 View of the Protestant Church at Durtsel from the town Square. 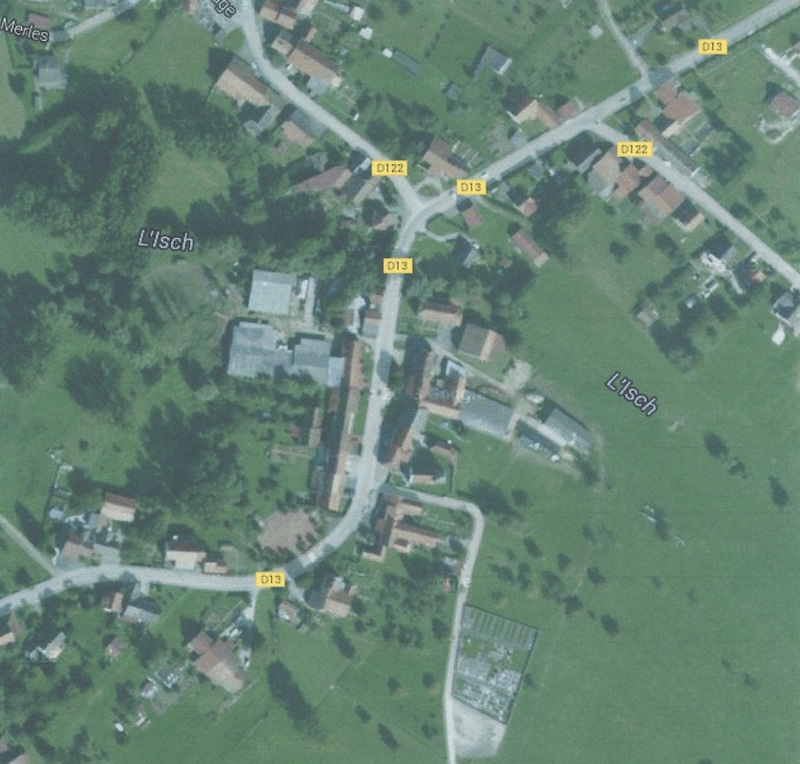 Village of Durstel with Protestant church in the upper right quadrant. 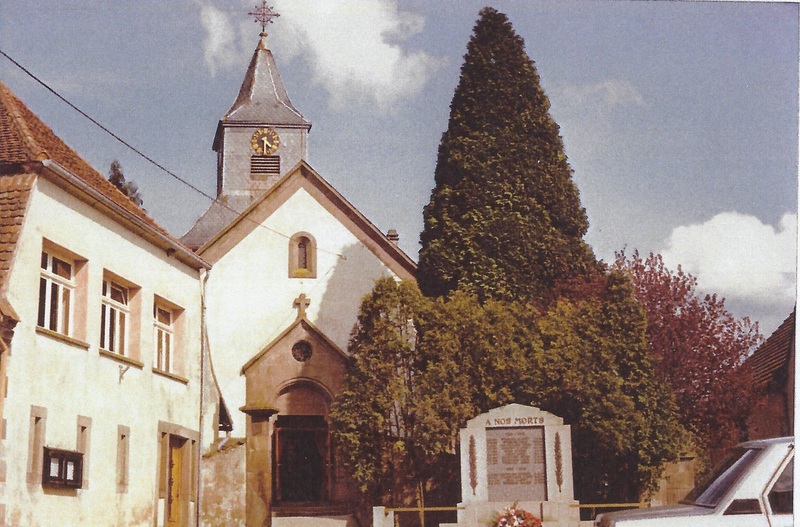 Dr. Emmert Bittinger continued his ancestral search and delved into the records of the Protestant Churches of Durstel and Ottwiller. 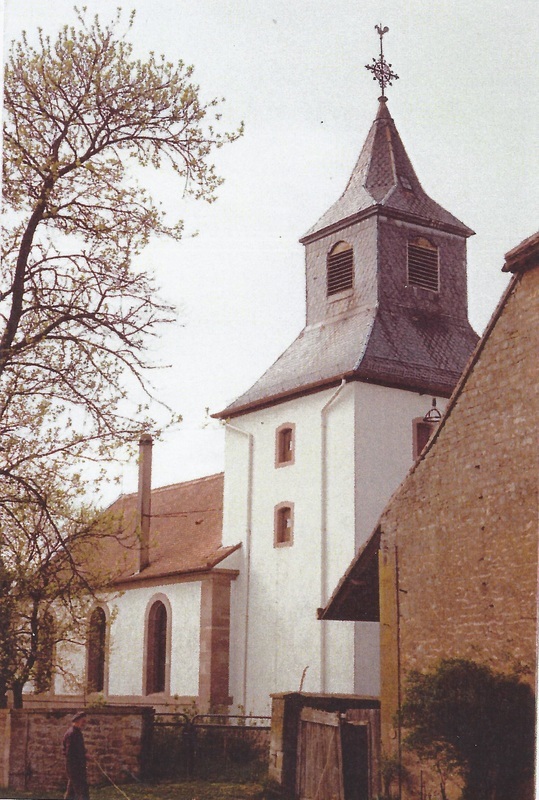 In the following story written by Dr. Bittinger he tells of his search in the church records and the results of his search for the Büdingers (commmonly spelled Buttinger and in one instance, Büdinger in the church records in Durstel and Ottwiller). Views of Protestant church at Ottwiller. Church and grounds are crowded by buildings and streets. Ottwiller main street with cattle fountain and manure pile. Village of Ottwiller with cemetery at bottom, right of center.